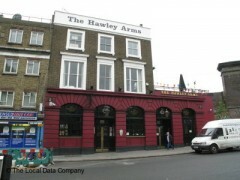 About: The Hawley Arms is a pub that serves a variety of beers, wines and spirits as well as selection of traditional pub dishes and snacks. I was introduced to this pub by a friend a few years back. I love it to bits!!! Wonderful staff, wonderful music and a great atmosphere. Quirly, cool and you feel instantly at home. Where else can you buy a pint of chips or a mug of wotsits? A great place for a quick pint if you want to get away from the crowds in the day and a brilliant place to start an evening out! Wonderful atmosphere with equally wonderful staff - entertaining and friendly. Ace menu – especially the Sunday roasts! Ten out of ten.